It is hard to believe today would have been your 3 year Ampuversary. A little less than a month of joining this group you had your amputation. I sure wish you would be here to celebrate it but I thought of you and shared your story today 🙂 So you weren’t forgotten at all. I had lots of complements on your necklace today too. You just are an amazing girl. Thank you for leaving a legacy to tell others about and share you with. I love you my sweet sweet girl. I sure hope you are having a great time with all of your friends up on the Bridge. Thinking of you on this ampuversary…..my heart aches for you and what you’ve been through. But your pain and grief has made you an advocate for others; it has given you the ability to help others down this path where we never dreamed we’d be. To comfort and guide us through this journey, with Sassy by your side and in your heart. Thank you for sharing this with us! Sassy you certainly have left a legacy here on earth! Your mom tells everybody about your journey and helps all us pawrents get through our own journeys. She’s a saint and I’ll bet you are so proud of her! Thanks for sharing her with us! She shows her love for you everyday with us. You will be with her forever in spirit and the love she has in her heart. 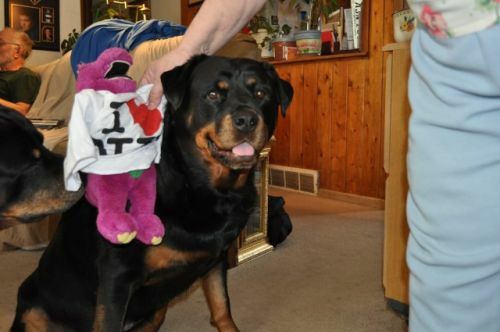 Talk about a way to show others that life is great on three legs…Sassy you are the Rottie Role Model Extraordinaire! Even in heaven you are inspiring others every single day. Whether 3 months or 3 years or more pass, you will always be in our hearts and an inspawration. I just joined cause my Zeusy just had his amputation 3 days ago. Not sure what type of cancer yet but biopsy showed Fibrosarcoma, waiting for second biopsy. Can you tell me a little about Sassy? Dx., tx, how long she lived? I’m so scared at times, I don’t know what to do. 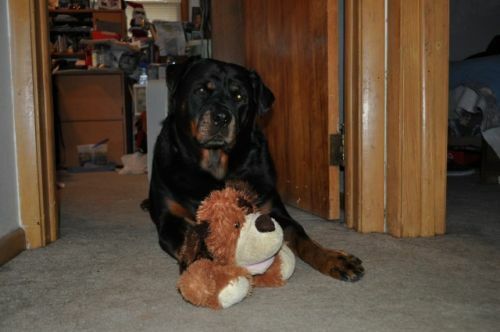 Zeus is a male Rottie, will be 7 on 12/1 and had his left hind quarter amputated 3 days ago. Thanks…. Sassy was diagnosed with Osteoscaroma at age 6. She had 2 biopsies where were inconclusive and we didn’t have the diagnosis definite until her biopsy on the complete leg. She had no mets until March 1st of 2013. We had competed 4 carboplatin chemos and were scheduled for a 5th and 4 days before her 5th chemo was when we found out it went to her lungs. She lived almost 9 3/4 months total after her amputation. Feel free to pm me.